Ice Cream Science – To Salt or Not To Salt? Investigate some more with ice cream! An important part of experimentation and design activities is knowing how to manipulate “variables”. Variables are things you can change about a design or an experiment that will change the outcome of that design or experiment. 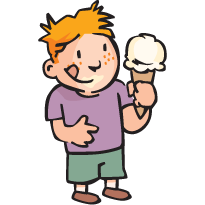 In the first Ice Cream Science activity, no “variables” were changed, but the amount of sugar, vanilla or cream could have been altered and the flavor of the ice cream would probably have changed. Each of these ingredients is a variable. The kind of milk or cream used could also be a variable—making one batch of ice cream with milk and another with cream might yield two different results. In this activity, students will experiment with a very important variable—the ice used to freeze the ice cream. Follow the preparation instructions from the first Ice Cream Science activity. If you prefer, you can use the instructions from the Ice Cream Science – A New Recipe instead, which will yield better results, but will require more materials. Have some water on hand as well. Ask your students what it was like when they made ice cream in the first Ice Cream Science activity. What did they notice about the bags (or coffee cans, if you followed the Ice Cream Science – A New Recipe instructions)? Ask them if they remember using the ice and salt. Do they think they could make ice cream just with the ice? Have each team choose which of these options they would like to try. Hopefully each of the four choices will be attempted by at least one team. If not, try to persuade some teams to experiment with the un-chosen option or options. As a last resort, assign teams which kinds of ice solution they will use. It is important that each of the options are tried by at least one team. Can you discover the best way to make ice cream? Separate children into teams of 2 or 3. Have teams talk to each other and decide which ice solution they would like to try (just ice; ice and water; ice and salt; or ice, salt and water). Have teams report to the rest of the group which type of solution they have chosen, and record this on a blackboard or a piece of chart paper. Teams using ice and salt should make their ice cream just as they did last time. Teams using just ice should skip the step where they add salt to their bags. Teams using ice and water should add 1 tablespoon of water to the ice. Teams using ice, salt and water should use the same amount of ice as last time, but add 1 tablespoon of salt and 1 tablespoon of water to it. Seal the bags up (or put the lids on the coffee cans) and shake (or twist) like crazy! After your students have been mixing and shaking their ice cream for a few minutes, ask them how long it took last time to make the ice cream. How long do they think it will take this time? They should keep shaking and squeezing their ice cream bags during this discussion. After the same amount of time has passed that it took to make ice cream in the first activity, have your students stop and open up their bags. What do they notice? Who has ice cream similar to what they made last time? Who doesn’t have ice cream yet? Have all of the teams zip their bags up again and shake for 5 more minutes. Do they have ice cream now? Which teams do not? Record these results. What do they notice about the ice solutions that worked and about those that didn’t? Have the teams that did make ice cream share it with those that did not. Hand out the “tasting cups” or bowls and use the tasting method described in the suggestions section of the first Ice Cream Science activity. Students should conclude that salt is required to make ice cream. The solutions that didn’t use salt will not work. The ice, salt and water solution may work a little better than the bags with just ice and salt in them, but these results may not be different enough to make that conclusion.